MTGStocks completed a great favor for the community when it released the list of 2014’s biggest risers and decliners of the year on January 1st. Starting with a request from Corbin, these two lists were soon noticed by myself and others for the valuable input they can provide to the community. The first insightful observation came from James Chillcott, who noticed that eighteen cards out of the top twenty risers of the year all started at less than $1 in value on January 1st 2014. 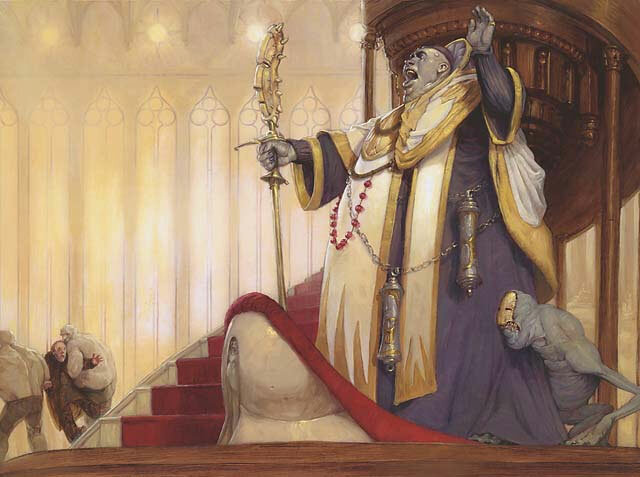 To give examples from the risers list, this means that if you bought in on cards like Choke, Stoke the Flames, Forked Bolt, and Orzhov Pontiff in January of 2014 you would have made out incredibly well if you held onto them until now. Of course, there is a significant danger in pointing this out. Many of the cards that made the top gainers list were either uncommons or came from pre-constructed sets. In other words, it would be very risky to pursue cards based on the uncommon rarity characteristic in hopes of seeing them receive humungous gains like the data shows. We can actually relate these gains to penny stocks. Sure, penny stocks regularly see the gains that cards like Fatestitcher can reach. I’ve even seen some penny stocks reach heights of 10,000%+ gains. Does this mean that it wasn’t risky to go after it? Of course not! Penny stocks are some of the most volatile assets on the market and I would argue that many gainers of the year fall into this category. Look at how many of them are uncommons or were printed in a pre-con or other supplementary product. *Onakke Catacomb (S) – One interesting “card” that made the top twenty that surprised me was Onakke Catacomb, a planechase Plane card that is only used in the casual format planechase. Yes folks, these cards have value too! If you happened to purchase any of the past planechase sets I would recommend busting out the oversize cards to check them for value. You never know which ones might be worth several dollars these days. OK, so in reality only six of the top twenty cards that made the list only had one printing, weren’t an uncommon, and weren’t printed in a pre-con. One interesting trend is that none of the cards are mythic rare – this means that mythic rares as a whole are much more stable price wise than rares and uncommons even if the mythic rare turns into a bulk mythic. Another trend amongst these remaining six cards is that they are all from out of print sets. The blue chip list, as David Schumann would say, provides insight into the most expensive cards that have had the largest gain this year. Revised dual lands fall into this list, but we also have some hard-to-find Legends cards that have shown up in addition to Modern, Commander, and Legacy staples. What surprises me most is the percentage gain that each of the cards has seen – all of the cards on the list gained at least 77% or more! The average amount that a card on this list gained was 110%!! Overall, this list tells me that Modern as whole has gotten very popular over the course of 2014 but also that the casual market, as always, reaches out with their invisible hands as well to create even higher prices for cards like Invoke Prejudice and In the Eye of Chaos. Each of these cards fell at least -71% from their highest historical price of 2014. Strangely enough, two of those cards are Legacy playable and have been played in some of the top tier Legacy decks of 2014. My theory for why this happened is twofold. Firstly, three of the cards were from Conspiracy which was a set released just last year. This means that stores had pre-order and release prices that in no way reflected the actual demand of the card. Once the initial “gotta have it NOW!! !” demand was depleted the stores had to lower the price to meet the actual market demand. Unfortunately, due to the somewhat large print run of Conspiracy and the fact that the cards were not Standard legal this meant that the price had to be considerably lowered from initial expectations of what stores thought the price should be. Secondly, the cards Misdirection and Stifle were both reprints of Legacy-only cards, which will pretty much always significantly reduce the current price of a card. I’m not surprised that they fell so much but the surprisingly deep fall of Misdirection in particular is quite shocking. We might look to the sage advice of buy low and sell later once the price has risen higher. The current $3 for Conspiracy Misdirection could change easily edge upward as time goes on since its Mercadian Masques counterpart is around $10. Speaking of buy low and sell high, the blue chip cards are the ones I would be most particular about watching for buying in at a lower price. Let’s see which cards by highest price have dropped considerably during 2014. As you probably surmised, the Onslaught fetchlands were going to be on this list due to their recent reprinting in Khans. Thankfully, Khans has also negatively affected the prices of the Zendikar fetches as well since players can easily replace a Zendikar fetch with a Khans fetch in a pinch. This means that fewer Zendikar fetches are needed in Modern these days, so therefore lower prices on the enemy fetches too. The most expensive card that has dropped considerably in price is the Player Rewards Wasteland, which has dropped $100 during 2014. If you’re in the market for foil Wasteland, this could be the deal that you’ve been waiting for. In terms of undervalued cards, I would put Voice of Resurgence as undervalued as well as Dack Fayden and Mutavault. I think these three cards, either due to casual or tournament demand, are going to start rising in price over this year and would be surprised if they continued to further decrease in price (unless they are reprinted of course, and then a drop in price is definitely not surprising). In terms of overall trends for cards in 2014, we can see that the top risers percentage wise were the penny stocks that happened to get noticed and explode in price – seemingly overnight. Price memory is a powerful force, since many of the cards in this category really haven’t put up too many results and yet still continue to demand a higher price going into 2015. I would stay away from almost all these cards, as they could all be reprinted again at some point and have already spiked. Looking at the blue chip gainers, we see that many are reserve list cards that have become noticed and picked up by casuals and tournament players alike. However, we also need to be cautious with this list too since cards like Noble Hierarch and Twilight Mire are included among their number – cards that we know are going to be reprinted eventually and that it is only a matter of time before they drop in price. Like any investment, please do your research even on these blue chip cards to determine if they are ones you should be picking up for value. Lastly, even the losers have lessons to teach us. What I have gleaned from them are that Standard staples drop the absolute hardest upon rotation and after they are forgotten about (Blood Baron of Vizkopa being the primary example here) so it is best to get rid of these cards when they have peaked in price during the Standard season. Also, Legacy-only staples that are reprinted will drop precipitously from a reprint, so watch for any Legacy reprints to get the most value out of your currently owned Legacy stuff. Finally, be aware that the reprinting of a cycle of previously valuable lands can have drastic effects on the other colors even if those color pairs aren’t reprinted right away. Not to say that there isn’t potential in the losers. Cards that are otherwise popular can sometimes drop in price simply due to a current overabundance of them in the market. Once they’ve circulated for a while, even after declining the price can start to rise again if the card generates significant tournament and/or casual demand. ADVERTISEMENT: We are proud to announce the brand new 3rd Edition Grimoire Deck Box. Preorder period is scheduled to be in Jan. Sign up for their newsletter to get the latest updates and offers. Great analysis of both lists and the meta-trends they help us understand! It’s always nice to see someone analysing the losers list too, that is often overshadowed by the winners list but yet contains as much information which we could learn from. I agree that Dack Fayden seems a bit too low right now. He is seeing play in three formats: Legacy, Vintage and EDH and barring a reprint, I doubt he will stay at $22.